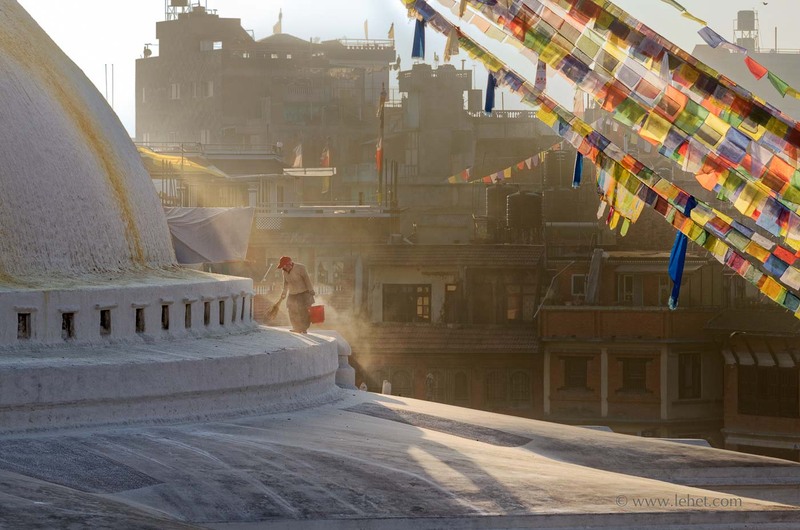 Here is another dawn at another Stupa. It’s not just that it’s a different morning from the photo posted last; this place, Boudhanath, has completely different energy. This morning was my third time at the Bauddha Stupa; we spent a whole morning starting at dawn. All three times there I felt an intensity, an egoless happiness. My wife had to pry me away each time. I want to move there. Our friend Sarbajit lives there, right there. (and in fact this image is exposed from his rooftop). I don’t think he needs to meditate: it meditates him. Except for the dead-on, “this is a direct photo of the stupa” images I was compelled to take over and over (some of them are in fact good! ), the hundreds of photos I exposed there have a vast range of texture, color, mood, and in one insufficient word: energy. But within that multiplicity of experience, there is a commonality. There is the quiet, awake center. People, many hundreds per day, circumambulate counterclockwise. It’s a parade of people of all ages; parents carry babies, and old folks limp slowly with canes. It’s a visual feast: clothes of all colors; birds; sky; changing light; prayer flags in the breeze; shops with all their dharma trinkets, art, and clothing displayed around. People feed the pigeons, which gather and disperse in huge flocks. I shifts and changes like mind, like life. And right in the center of that, there is a focus, an awakeness, and a sense of devotion. There is the accumulation of the merit of centuries of that devotion and thousands of awake and focused minds. That seems to radiate, maybe from the center of the stupa. It’s hard to find a source for something like that. Probably there is no spatial or temporal source for that sense of energy that pervades this place — put it feels that way, “It’s coming from here, somewhere, now.” But no. It’s timeless. It helps me to realize it’s ultimately placeless as well. It’s something we make with our minds. This entry was posted in Buddha, Meditation, Nepal, people on March 29, 2013 by john lehet.